Thurrock Teaching School Alliance has been designated by the NCTL as the regional training centre for Pupil Premium Reviewers for the East of England, and offers training for suitable colleagues who are preparing to undertake Pupil Premium Reviews or for members of SLT who want to understand how the process works and how it can benefit their school. The cost of the training is £250, and this includes lunch, certification and resources. Reviewers will be able to charge for any reviews they undertake. 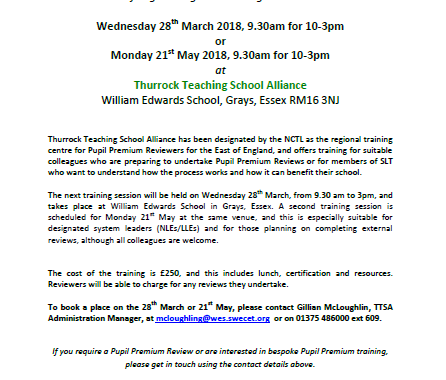 To book a place on the 28th March or 21st May, please contact Gillian McLoughlin, TTSA Administration Manager, at mcloughling@wes.swecet.org or on 01375 486000 ext 609. Tagged PP, pupil premium, reviewer, training.